Mary Christine Brockert (March 5, 1956 – December 26, 2010), better known by her stage name Teena Marie, was an American singer-songwriter, and producer. She was known by her childhood nickname Tina before taking the stage name Teena Marie and later acquired the nickname Lady Tee (sometimes spelled Lady T), given to her by her collaborator and friend, Rick James. She was known for her distinctive soulful vocals, which caused many listeners to believe she was African American. Her success in R&B and soul music, and loyalty to these genres would earn her the title Ivory Queen of Soul. She played rhythm guitar, keyboards, and congas, and wrote, produced, sang, and arranged virtually all of her songs since her 1980 release, Irons in the Fire, which she later said was her favorite album. Mary Christine, or Tina as she was called, was the daughter of construction worker Thomas Leslie Brockert and his wife, home renovator Mary Anne. She spent her early childhood in Mission Hills, Calif. Her ethnic heritage was Portuguese, Italian, Irish, and American Indian. In 2005, while visiting Louisiana, she had discovered that her paternal ancestors once lived in New Orleans. She took to singing naturally, performing Harry Belafonte's Banana Boat Song by age two. She also developed a fondness for singing Motown songs, and her self-professed "gift from God" would become fine-tuned as the years progressed. When she was eight years old, her parents began sending Tina on auditions which, among other things, netted her an acting role on The Beverly Hillbillies, credited as Tina Marie Brockert. She also sang at the wedding of Jerry Lewis' son when she was 10 years old. Reared in a Roman Catholic household, she learned to play the piano under the tutelage of two nuns, and later taught herself the guitar, bass, and congas. She would go on to form a semi-professional R&B band with her younger brother Anthony and their cousin. In the early 1970s, after the family moved to Venice, Los Angeles, Brockert spent her adolescent years in the historically black Venice enclave of Oakwood, nicknamed "Venice Harlem". There, she would acquire a strong spiritual influence from neighborhood matriarch Berthalynn Jackson, a black woman who would become her godmother. While attending Venice High School, Brockert joined the Summer Dance Production and was the female lead in the school's production of The Music Man. She also fronted a local Venice rock band "Truvair" in 1974–1975; the band's members were her high school classmates: Freddie Garcia (guitar-lead/rhythm); Roy Benjamins (bass); Joe Ponce (keyboards); Johnny Aguila (aka Sugar Bear - drums); & Al Carter (congas). Following graduation, Brockert juggled auditioning for various record companies with studying English Literature at Santa Monica College. She credited her love of reading with helping her to write lyrics. Her portrait graced the cover of her second album, Lady T (1980), which is also noted for having production from Richard Rudolph (the widower of R&B singer Minnie Riperton). Teena Marie had asked Berry Gordy to contact Rudolph and secure his input, as Rick James was unavailable, and she felt unprepared to be sole producer of her own material. Rudolph intended for the song he penned, "Now That I Have You", to be sung by his wife, but it was later given to Teena Marie. Rudolph also co-composed the single "Behind The Groove", which reached number 21 on the black singles chart and No. 6 on the U.K. singles chart in 1980. The song would also be included on the soundtrack of Grand Theft Auto: Vice City on the Fever 105 soundtrack. Another notable track, "Too Many Colors", featured Rudolph and Riperton's then 7-year-old daughter, Maya Rudolph, who became Teena Marie's goddaughter. Also in 1980, Teena Marie released her third LP, Irons in the Fire, for which she handled all writing and production herself, including the horn and rhythm arrangements of her band, and all backing vocals, achievements considered rare at the time for a female artist. The single "I Need Your Lovin'" (#37 Pop, No. 9 Black Singles) brought Teena Marie her first top 40 hit; it also peaked at No. 28 in the UK chart. That same year, Teena Marie appeared on James' album, Street Songs, with the duet "Fire and Desire". In an interview, Teena Marie said she had a fever at the time yet managed to record her vocals in one take. After the session, she was driven to a hospital. The two would perform the single at the 2004 BET Awards, which would be their last TV appearance with one another, as James died later that year. Teena Marie continued her success with Motown in 1981, with the release of It Must Be Magic (#2 Black Albums Chart), her first gold record, which included her then biggest hit on R&B, "Square Biz" (#3 Black Singles). Other notable tracks include "Portuguese Love" (featuring a brief, uncredited cameo by James, No. 54 Black Singles), the title track "It Must be Magic" (#30 Black Singles), and the album only track "Yes Indeed", which she cited as a personal favorite. In 1982, Teena Marie got into a heated legal battle with Motown Records over her contract and disagreements about releasing her new material. The lawsuit resulted in "The Brockert Initiative", which made it illegal for a record company to keep an artist under contract without releasing new material for that artist. In such instances, artists are able to sign and release with another label instead of being held back by an unsupportive one. Teena Marie commented on the law in an LA Times article, saying, "It wasn't something I set out to do. I just wanted to get away from Motown and have a good life. But it helped a lot of people, like Luther Vandross and the Mary Jane Girls, and a lot of different artists, to be able to get out of their contracts." She left Motown as the label's most successful white solo act. In 1984, Teena Marie released her biggest-selling album, Starchild. It yielded her biggest hit "Lovergirl", which peaked at No. 4 on the U.S. Billboard Hot 100 chart in March 1985 and at No. 9 on the R&B chart. The label also released the moderate R&B hit "Out on a Limb", which peaked at No. 56 on the R&B chart but didn't break the Hot 100. "14k" was featured on the soundtrack of the film Goonies (1985) but was not a hit (only making the U.S. R&B charts at #87). In 1986, Teena Marie released a rock music-influenced concept album titled Emerald City. It was controversial with her established fan base and not as successful as its predecessors. She also recorded the rock-influenced track, "Lead Me On", co-produced by Giorgio Moroder, for the soundtrack of the box office hit film Top Gun (1986). In 1988, she returned to R&B and funk, releasing the critically acclaimed album Naked to the World. That album contained the hit "Ooo La La La", which reached the top of Billboard's Hot R&B/Hip-Hop Singles & Tracks chart and was her only No. 1 single on that chart. During her 1988 Naked to the World concert tour, she suffered a fall and was hospitalized for six months. Teena Marie released Ivory in the fall of 1990; it scored no pop hits, but it did experience two R&B hits: "Here's Looking at You" (#11 R&B) and "If I Were a Bell" (#8 R&B). During the 1990s, Teena Marie's classic R&B, soul, and funk records were either sampled by hip-hop artists or covered by R&B divas. Teena Marie herself is regarded as something of a pioneer in helping to bring hip-hop to the mainstream by becoming one of the first artists of her time to rap one of her singles—the aforementioned "Square Biz". In the hip-hop portion of that song, she mentions some of her inspirations: Sarah Vaughan, Johann Sebastian Bach, Shakespeare, Maya Angelou, and Nikki Giovanni. In 1996, the Fugees paid tribute to her by interpolating the chorus of her hit, "Ooo, La, La, La" (1988), into its own "Fu-Gee-La". In the fall of 1994, Teena Marie released Passion Play on her independent label, Sarai Records. Lacking the backing of a major label, this album sold less well than her earlier albums but was well received by fans. Subsequently, Teena Marie devoted most of her time to raising her daughter Alia Rose (who has since adopted the stage name "Rose Le Beau" and is pursuing her own singing career). During the late 1990s, she began working on a new album, titled Black Rain. she was unable to secure a major label deal for the album and did not want to put it out on her own Sarai label, in light of the modest sales of Passion Play. However, a version pressed for promotional purposes was widely bootlegged among fans. This contained the tracks, "The Mackin' Game", "I'll Take the Pressure", "Baby, I'm Your Fiend", "My Body's Hungry", "Ecstasy", "I'm on Fire", "Watcha Got 4 Me", "Black Rain", "1999", "Butterflies", "Spanish Harlem", "Blackberry Playa", "The Perfect Feeling", and "Rainbow Outro". Most of these tracks resurfaced on the later albums: La Doña, Sapphire, Congo Square, and Beautiful; in some cases (e.g., "The Mackin Game", and "Spanish Harlem" (retitled "Maria Bonita" on Beautiful)), in significantly reworked versions. Her "Square Biz" was remade as "Hollywood Square Biz" on the hit TV game show Hollywood Squares from 2002–2004. After a 10-year hiatus from the music industry, Teena Marie returned to her musical career by signing with the Classics sub-label of the successful hip-hop label, Ca$h Money Records. She released her eleventh album, La Doña, in 2004, and follow up Sapphire, in 2006. La Doña became a gold-certified success (and the highest-charting album of her career, peaking at No. 6 on the Billboard 200 chart) on the basis of the Al Green-sampled "I'm Still In Love" (#23 R&B, No. 70 Pop) and a duet with Gerald Levert, "A Rose by Any Other Name". Teena Marie was nominated for a 2005 Grammy Award for Best Female R&B Vocal Performance for "Still in Love" and quickly followed this success with the release of Sapphire in 2006. While sales were not as strong this time (the album peaked at No. 24 on the Pop Chart), the release yielded yet another R&B Top-40 hit, "Ooh Wee" (#32); it also reunited her (on "God Has Created" and "Cruise Control") with Smokey Robinson, the early Motown mentor whose style she had emulated on early hits, such as "Young Love". Teena Marie parted ways with Ca$h Money records after the release of Sapphire. On September 19, 2008, Teena Marie performed in concert at B.B. King's Blues Club in New York City. She took this time to play a couple of finished tracks from her upcoming album, Congo Square, and she received a positive response from the crowd. Congo Square was released on June 9, 2009 on Stax/Concord Records. Teena Marie has described the album as "personal and spiritual", and indicated that it was more jazz-influenced than most of her previous work. "Can't Last a Day", a duet with Faith Evans, leaked to the Internet in March 2009. Teena Marie says of Evans, "It was after I had recorded the song ("Can't Last a Day") I got the idea to put Faith on it. I've always loved Faith and her vocal style. She reminds me of me. Her correlation with Biggie — having a career with him and without him – reminds me of me and Rick. I feel like she's a younger me. Of the younger ladies, she's the one I love most." Meanwhile, with regard to her early-life inspirations for Congo Square, in January 2010 Teena Marie told Lee Tyler, editor of Blues & Soul magazine: "I wanted to do songs that reflected the things that I loved when I was growing up. Every single song on the record is dedicated to someone, or some musical giant that I loved. 'The Pressure' is dedicated to Rick James; 'Can't Last a Day' is dedicated to the Gamble & Huff sound – the Philly International sound'. Then 'Baby I Love You' and 'Ear Candy' are dedicated to Marvin Gaye and Curtis Mayfield – with memories of riding down Crenshaw in LA in jeeps and bumping to music on the 808 i.e. Roland TR-808 drum machine. While 'Miss Coretta' is, of course, dedicated to Mrs. Coretta Scott King, the late wife of Martin Luther King." Sales-wise, the album proved another success, reaching the Top 20 on Billboard's Top 200, and giving Teena Marie yet another Top 10 R&B chart entry. 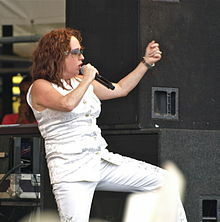 In 2010, Teena Marie continued to be a headliner on the Las Vegas Strip, appearing regularly at the Las Vegas Hilton and other venues until just before her death. At the time of her death, Teena Marie had been in the process of completing her 14th album, Beautiful. It was finished posthumously by her daughter, Alia Rose, and released on January 15, 2013. Teena Marie never married. She gave birth to a daughter named Alia Rose in 1991. As of 2009, Alia Rose sings under the name Rose LeBeau. Throughout her career, Teena Marie lived in Inglewood and Encino, Los Angeles, before settling in Pasadena, California in the mid-1980s. Teena Marie was godmother to actress-comedian Maya Rudolph and to Marvin Gaye's daughter, Nona Gaye. She also cared for Rick James' son, Rick, Jr., and family friend Jeremiah O'Neal. Lenny Kravitz posted a video in which he said that Teena Marie had taken him into her home and helped him when he was struggling early in his career. In 2004, while Teena Marie was sleeping in a hotel room, a large picture frame fell and struck her on the head. The blow caused a serious concussion that would cause momentary seizures for the rest of her life. On the afternoon of December 26, 2010, Teena Marie was found unresponsive at her home in Pasadena by her daughter, Alia Rose. On December 30, 2010, an autopsy was performed by the Los Angeles County coroner, who found no signs of apparent trauma or a discernible cause of death, and concluded she had died from natural causes. She had suffered a tonic–clonic seizure a month before. A memorial service was held at Forest Lawn Cemetery on January 10, 2011. Among those in attendance were Stevie Wonder, Deniece Williams, Smokey Robinson, Queen Latifah, LisaRaye, Sinbad, Tichina Arnold, Shanice Wilson, and Berry Gordy, Jr.
^ "Teena Marie". The Gondolier: Venice High School yearbook. 1974. ^ "R&B Singer Teena Marie Dead at 54". Rolling Stone. ^ "Teena Marie, 1980s R&B Hitmaker, Dies at 54". New York Times. ^ "At home with Teena Marie and daughter, Alia Rose". Jet. October 30, 2006. ^ a b "Teena Marie's Life in Pictures". Essence. December 27, 2010. Retrieved December 27, 2010. ^ a b Kristin Gray (December 27, 2010). "Teena Marie Dead at 54". afro.com. Retrieved December 28, 2010. ^ "Biography" (Adobe Flash). ivoryqueenofsoul.com. May 12, 2008. Retrieved December 27, 2010. ^ a b c d Alex Henderson. "Teena Marie | Biography & History". AllMusic. Retrieved 2016-11-14. ^ "Grand Theft Auto: Vice City, Vol. 6 – Fever 105: Rene & Angela, Whispers: Music". Amazon.com. Retrieved April 17, 2012. ^ "2004 BET Awards: It's a Wrap". Vibe.com. Retrieved 2016-11-14. ^ "Teena Marie". Michaelbaisden.Com. January 1, 1970. Retrieved April 17, 2012. ^ "Teena Marie remains true to R&B". Los Angeles Times. December 29, 2004. ^ Billboard. March 30, 1985. ISSN 0006-2510. Retrieved August 15, 2013. ^ Vibe. Vibe Media Group. November 1994. p. 88. ISSN 1070-4701. Retrieved August 15, 2013. ^ "teena marie Alia Rose". YouTube. Retrieved April 17, 2012. ^ "Faith Evans gets Soulful with Teena Marie!". Blog.singersroom.com. March 24, 2009. Retrieved April 17, 2012. ^ "Teena Marie interview by Lee Tyler, 'Blues & Soul' January 2010". Bluesandsoul.com. Retrieved April 17, 2012. ^ Emily Cary (August 27, 2009). "Teena Marie gets 'Up Close and Personal' at Birchmere". The Washington Examiner. p. 33. Retrieved December 27, 2010. ^ "SoundSpike, December 27, 2010". Soundspike.com. December 27, 2010. Retrieved April 17, 2012. ^ Ziegbe, Mawuse (December 27, 2010). "Teena Marie Remembered By Lenny Kravitz, Swizz Beatz, Q-Tip". MTV. Retrieved January 5, 2011. ^ Goffard, Christopher (December 26, 2010). "Los Angeles Times, December 26, 2010". Los Angeles Times. Retrieved April 17, 2012. ^ a b c Ziegbe, Mawuse (December 30, 2010). "Teena Marie Autopsy Fails To Pinpoint Cause Of Death". MTV. Retrieved January 5, 2011. ^ the CNN Wire Staff. "Notice of Teena Marie's death at CNN.com". CNN. Retrieved April 17, 2012. ^ "Teena Marie Died During Sunday Nap". TMZ. December 27, 2010. Retrieved December 31, 2010. ^ "Robinson, Gordy, Wonder pay tribute to Teena Marie". Today.com. NBC. AP. January 10, 2011. Retrieved February 22, 2016. ^ Turner, Miki (February 7, 2011). "Entertainment: Memorial for Teena Marie". Jet. Retrieved February 22, 2016.